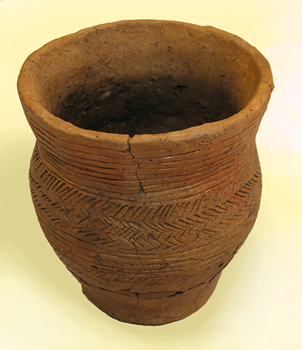 Beakers are one of the most well known forms of prehistoric pot in Britain. Originating from Continental Europe, it used to be thought that Beakers were brought to Britain by Continental immigrants, but it is now thought that it was just the ideas behind Beakers that spread, not the people themselves. Beakers tend to be found in graves, often with other special objects such as gold ear-rings and flint tools, and they were originally interpreted as drinking vessels, which is how they got their name. There is a great deal of variety in the types of Beakers found in Britain. Traditionally, Beakers are viewed as being well-made pots, but this isn’t always the case, with many badly made Beakers in existence. Beakers do, however, tend to have an ‘S’ shaped profile, and are often thin-walled. 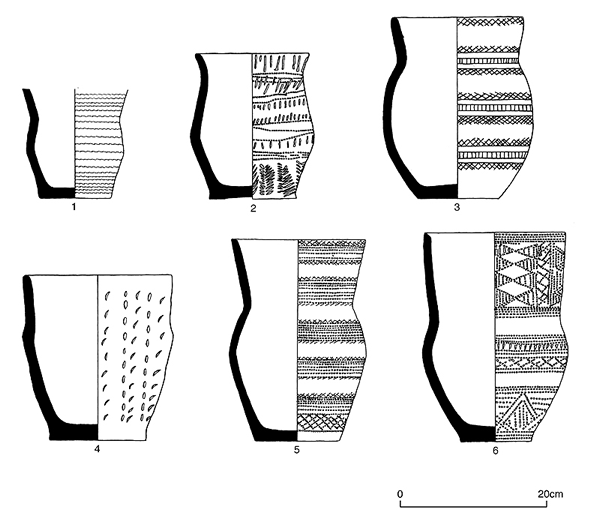 A selection of Beakers from the north east can be seen here, demonstrating the diversity of forms present in the archaeological record. In the past, archaeologists have attempted to categorise this wide variety, resulting in some very complex type series. However, these are not very useful for understanding Beakers, particularly in north east England. Some terms are useful for describing Beakers though, for example short-necked Beakers, (for example the Beaker from Blaydon), long-necked Beakers (for example the Beaker from Seahouses) and all-over-corded (or combed) Beakers (for example the Beaker from Plenmellor Common). These terms refer to the shape of the pot or its decoration. The range of decoration on Beakers is diverse. Whilst it is true that many pots were profusely decorated with complex designs, many were not. Very simple pots, with simple fingernail decoration, such as the one from Huntlaw were also made. Beaker decoration is usually characterised by the use of geometric motifs and made full use of twisted cord and comb impression. Decoration could cover the whole body of the pot (for example the Plenmellor Common pot), or could occur in zones (for example on the Bellingham and Blaydon pots). Whilst some pots were carefully decorated in great detail (such as the Seahouses pot), some appear to be a little more carelessly decorated, as on the Horton Castle vessel.